Compression pumps are a valuable tool when it comes to providing intensive compression therapy. Compression pumps come in two styles: lymphedema pumps or DVT pumps. Lymphedema Pumps and DVT Pumps are unique in that they treat the diseases distinctly different. Lymphedema and DVT sleeves can only be used in conjunction with their corresponding pump to deliver compression. Total Compression Pumps proudly provides each type of pump from several quality brands so there is more choice for those who need intensive compression therapy. Total Compression Pump is a leading, national provider of Lymphedema, Venous Insufficiency, Peripheral Artery Disease and Deep Vein Thrombosis Pneumatic Compression Pumps. We have many years of experience. We do all the work for you, successfully dealing with doctors and insurance companies to get your compression device approved and delivered. Everything starts with your call. If you call today you can get a compression device in a week. Our dedicated team will work hard to assist you in getting a compression pump and we will do our best to make it as affordable as possible. We are Compression Pump specialists, not a large Durable Medical Equipment company that sells many products. We focus on lymphedema and compression pumps only. Our years of experience are a benefit to you, our customers. You will deal with efficient professionals and get your pump quickly. Remember, we work for you. Your satisfaction and well-being are important to us. We provide compression pumps throughout the United States, as well as overseas. If you do not have insurance, or if you have a high deductible, we will work to get you an affordable compression pump. Please call 800 854-0335 to discuss how we can help you get the most effective compression pump at little or no cost to you or, complete our Contact Form. Many of our patients were so tired of compression stockings and the amount of time-spent daily, getting them on. It was a struggle that became their ‘daily battle.’ Others had appointments a few days week, at the physical therapist’s office, wrapping and bandaging their legs. Taking time out of their busy schedule a few days a week became an exhaustive burden. There is another solution that is stress free, relaxing and more effective. As lymphedema is not curable, the treatment chosen will last for many years and should not be a negative experience, nor cause stress. A compression pump is used in the comfort of your home, while resting or doing whatever passive activity you chose…TV, reading, computer, etc. We will take care of everything for you; from sending the paperwork to your Doctor’s office to getting insurance company authorization, while continually giving status updates until your pump is delivered. We’ll send you a treatment plan and we’ll be available to guide set-up and answer any questions you may have regarding your new pump. A Pneumatic Compression Pump is an easier, cost effective and less time consuming solution for individuals with lymphedema/venous insufficiency, DVT and/or PAD. It diminishes pain and discomfort, reduces swelling and edema, increases circulation and provides a healthier lifestyle for patients. Please call us if you have any questions regarding any of our pumps. 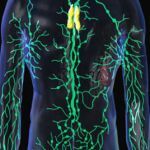 The Lymphatic System is an important part of the immune system. It is comprised of a network of tissues, ducts and lymph nodes (colored green) which drain fluids from your body’s tissues. The fluids carry toxins and other waste products to your lymph vessels/nodes, so your body can eliminate. When lymph nodes/vessels are damaged or blocked, due to a variety of reasons, edema (swelling) occurs. The most common symptom of lymphatic obstruction, or lymphedema, is swelling in one or both of your arms or legs. A Pneumatic Compression Pump along with sleeves, for one or both extremities, is often prescribed by doctors. The compression pump does for you what your body used to do; it eliminates stagnant lymph fluid from extremities, which reduces swelling, discomfort and pain. 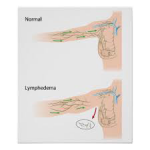 Breast Cancer patients often get Lymphedema in their arm due to lymph node removal during their operation. The body loses the ability to eliminate arm fluid, sometimes immediately after their operation, but often, from a few to many years, after their operation. A Pneumatic Compression Pump and Arm Sleeve are often prescribed by doctors to help alleviate swelling, pain and discomfort. What is the cause of lymphedema and what are the symptoms?